Tri-State has been working closely with Hangsterfer’s for a very long time. We value their dedication to using only virgin, raw materials. This first step results in the best product out there. Without a doubt this is the most effective, environmentally conscious created product line out there. The Hangsterfer’s family cares about you and your shop, as much as we do. 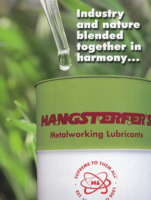 Hangsterfer’s Laboratories produces coolants and other lubricants used in all sectors of the metalworking industry. They are a family owned and operated company born in 1937. Together we will overcome costly machining problems, reduce down-time and maintenance costs and dramatically improve your company’s bottom line. Their product is made in the USA in Mantua, NJ. Tri-State stocks the below top selling products in 5-gallon pails and/or 55-gallon drums and can deliver locally the same or next day in most cases. Coolant Concentrates – Hangsterfer’s bio-stable technology has evolved from the high quality Water-Soluble Oils (high oil content) into Semi-Synthetic (low oil content) and Full Synthetics (no oil content). Hangsterfer’s only uses highly refined, ultra -pure ingredients. All of Hangsterfer’s Coolant Concentrates are formulated with advanced technologies, which utilize synthetic, vegetable and petroleum components. They do not use Diethanolamine (DEA), which is the leading cancer risk associated with the use of coolants. S-500 CF A water soluble oil concentrate with specially formulated anti-weld and anti-wear compounds for use on ferrous and non-ferrous metals especially aluminum alloys. S-555 A chlorine free soluble oil capable of excellent corrosion protection of yellow metals and other easily stained materials. S-1001 For severe metal removal, especially turning, drilling, cut tapping, thread rolling and milling of exotic aerospace materials. HE-2 A high viscosity water soluble oil used for severe tapping, broaching, hobbing, stamping and drawing applications. Often recommended to replace straight oils. S-787 Hangsterfer’s S-787 semi synthetic represents the next generation in semi-synthetic technology. Designed with the job shop in mind, it is an ideal multi purpose fluid that provides outstanding machinability and cleanliness. S-777 Crystal Cut 777 is the very latest in full synthetic formulations. Crystal Cut 777 utilizes specialized ingredients to achieve outstanding results in a wide variety of applications. R-100 G An excellent grinding synthetic, especially useful in Blanchard grinders and deburring tumblers. Cutting Oils -Hangsterfer’s Cutting Oils are recognized by Swiss Style Screw machine manufacturers around the world. Hard Cuts have improved tool life and surface qualities by as much as 300%! In addition to the lubricity provided at the cutting zone, our cutting oils provide excellent lubrication for the machine’s slides, guide bushings, bearings, and spindles. Some can even be used in bar feeders. Hangsterfer’s Hard Cut Series is formulated with the industry’s safest chlorinated extreme pressure additives. Our Missile Lube Series is both chlorine and sulfur free. Hard-Cut 5258 Light A unique cutting oil intended for use in Swiss-style Automatics which are dedicated to very difficult to machine alloys, especially High Temperature Alloys. Hard-Cut 5318 Based on Hard Cut 531, Hard Cut 5318 is great for use in both CNC or Cam-style Automatic Screw Machines. Usually used on larger diameter bar stocks. Hard-Cut 5418 An outstanding all-around cutting oil. It can be used in Swiss-style Automatics, Milling Machines, Light Stamping, you name it! Hard-Cut 5518 Ideal for turning small diameter bar stocks in CNC Automatics. Hard-Cut 5618 Another unique product from Hangsterfer’s, Hard Cut 5618 is used in grinding, horizontal machining, Swiss-Style turning, light stamping and forming. Hard-Cut NG Hard Cut NG is the Next Generation, hence “NG”, in the full line of straight oils developed, manufactured and offered by Hangsterfer’s. Hard-Cut NG CF Hard Cut NG is the Next Generation, hence “NG”, in the full line of straight oils developed, manufactured and offered by Hangsterfer’s. Missile Lube 1 This is the heavier of the three oils. The viscosity makes it suitable for use in many CNC lathe applications including Swiss-style Automatics. Missile Lube 1 XL This is the most popular of the three Missile Lubes. It can be used in virtually all metalworking applications that require a chlorine free and sulfur free cutting oil. CC 22 These economically formulated oils are blended under the same quality control standards set for the premium Hard Cut® Series. PC 20 Hangsterfer’s introduces a new series based on Polar Cutting technology and advanced Very High Flash Point (VHF) chemistry. The combination of the Polar technology and VHF chemistry takes the metalworking process to new heights. SuperAllTap CF Used in metal forming applications. Does not contain chlorinated paraffins or high concentrations of sulfur. Aqueous Cleanable, Oil Free. Machine Lubricants – Nearly 30 years ago, Hangsterfer’s developed “coolant compatible” machine lubricants that do not cause negative coolant effects such as odor, staining and dermatitis. Their unique “coolant compatible” formulation allows the oil to remain on the sliding surface in a completely fluid-like state, thus protecting the surface more effectively than old technology. Water is repelled which improves lubrication and prevents corrosion. Once you perform the easy conversion to our Way Oil Series you will immediately see the benefits.